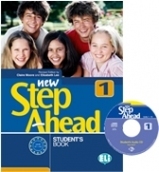 New Step Ahead 1 - Student’s Book + CD-ROM Level A1-A2 Student’s Book 1 begins with a Starter Unit containing revision activities and topics from the Primary School curriculum. 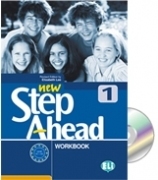 Each volume contains 10 Units divided into Modules: Grammar, Steps to Communication where students can...more..
New Step Ahead 1 - Workbook + Audio CD Level A1-A2 The majority of the exercises of the Workbook cover reading, writing and listening, but there are also special Study Skills pages where students find tips for learning. Each Unit is divided into Grammar...more..
New Step Ahead 1 - Portfolio Level A1-A2 The Portfolio is divided into Passport, Linguistic Biography and Dossier. 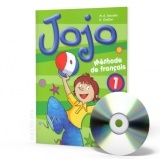 It encourages self-evaluation and helps organize study during the first year of education. 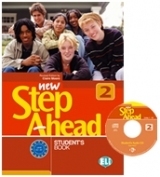 more..
New Step Ahead 1 - Teacher's Book + Class CD Level A1-A2 Teacher’s Book : As well as an introduction to the methodology of the course, the teacher’s book includes check lists for self-evaluation of levels A1-A2 of the CEF. 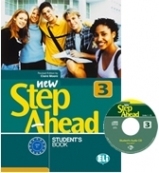 There are also sections...more..
New Step Ahead 1 - Test Book + Audio CD Level A1-A2 Contains an entry test, an end of Unit revision test, an end of Module revision test and 5 final tests covering the skills required in external examinations. Structure and aims of the course New Step...more..
New Step Ahead 2 - Student’s Book + CD-ROM Level A2-B1 Student’s Book 2 contains 10 Units divided into Modules: Grammar, Steps to Communication where students can put what they learn into practice, Skills to allow intensive practise of the four skills. 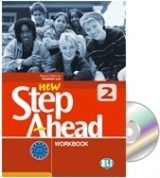 Each Module ends with a...more..
New Step Ahead 2 - Workbook + Audio CD Level A2-B1 The majority of the exercises of the Workbook cover reading, writing and listening, but there are also special Study Skills pages where students find tips for learning. Each Unit is divided into Grammar...more..
New Step Ahead 2 - Portfolio Level A2-B1 The Portfolio is divided into Passport, Linguistic Biography and Dossier. 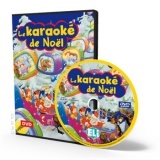 It encourages self-evaluation and helps organize study during the first year of education. 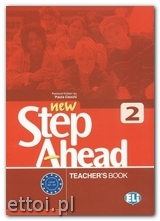 more..
New Step Ahead 2 - Teacher's Book + Class CD Level A2-B1 Teacher’s Book : As well as an introduction to the methodology of the course, the teacher’s book includes check lists for self-evaluation of levels A1-A2 of the CEF. 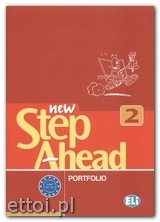 There are also...more..
New Step Ahead 2 - Test Book + Audio CD Level A2-B1 Contains an entry test, an end of Unit revision test, an end of Module revision test and 5 final tests covering the skills required in external examinations. Structure and aims of the course New...more..
New Step Ahead 3 - Student’s Book + CD-ROM Level B1 Student’s Book contains 10 Units divided into Modules: Grammar, Steps to Communication where students can put what they learn into practice, Skills to allow intensive practise of the four skills. 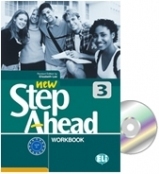 Each Module ends with a...more..
New Step Ahead 3 - Workbook + Audio CD Level B1 The majority of the exercises of the Workbook cover reading, writing and listening, but there are also special Study Skills pages where students find tips for learning. Each Unit is divided into Grammar...more..
New Step Ahead 3 - Portfolio Level B1 The Portfolio is divided into Passport, Linguistic Biography and Dossier. It encourages self-evaluation and helps organize study during the first year of education. more..